The customs checkpoint is situated at the Georgian border to Turkey, on the shore of the Black Sea. 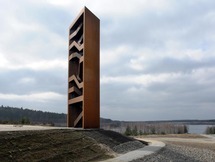 With its cantilevering terraces, the tower is used as a viewing platform, with multiple levels overlooking the water and the steep part of the coastline. 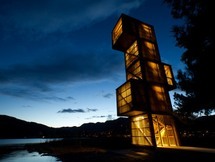 In addition to the regular customs..
During recent years a number of observation platforms have been created attempting by different means to confront the visitor with the beauties of nature. 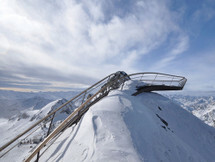 This panorama platform was commissioned by the management of one of the five glacier ski arenas in Austria. Like most of its competitors the.. The Timmelsjoch is the deepest, non-glaciated indentation in the main Alpine ridge between the Reschen Pass and the Brenner Pass. A road, once a mule track, links the Passeiertal valley and the Ötztal valley. Over thousands of years, unique similarities between the two valleys evolved,.. 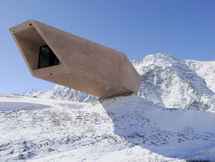 Designed by two architects Todd Saunders & Tommie Wilhelmsen, the 33-metre “diving board” shooting out from the road into thin air above the Aurland Fjord in Norway. 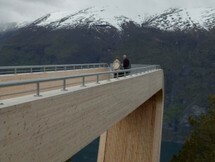 This Aurland Lookout project is part of a national program on tourist routes commissioned by the Norwegian Highway Department. The Timmelsjoch is a well-known high mountain pass that links the Ötztal Alps along the border between Austria and Italy. The pass has historically been an important route for travel and is now famous for its hiking, climbing and recreation options. 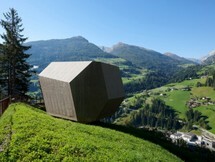 The Timmelsjoch Experience was created to help.. When driving across the island of Senja,one of the largest islands in Norway, this is the first point where you can see the ocean. The two side cantilevering construction offers a breathtaking view towards the north atlantic in the west, as well as the canyon below (east). The construction is.. The National tourist routes are being developed and operated by the Norwegian Public Road Administration as a nationwide project. 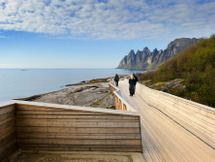 The Tungeneset-project is the first to be opened at the Senja-route. 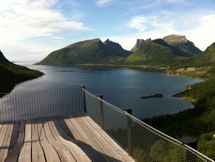 Senja is an island in the north of Norway, the project is located at the tip of an penninsula.. The myth about a sea serpent in the lake of Seljord has become an integral part of how the local people of Telemark conceive its majestic landscape. Tales about mysterious phenomena in the lake have flourished for centuries and are a natural part of the daily life in the area. Between Dresden and Berlin is based the largest artificial lake landscape in Europe - Lusatian Lake Land. The mighty craters left behind where huge diggers once lifted lignite out of the earth are now being flooded. A former moonscape is being transformed into a »water world« of thirty lakes, ten.. 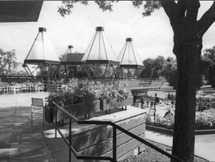 The Serpentine Restaurant was a canopy-like building in Hyde Park which was dedicated to new private catering facilities. It was a part of a project which included two new restaurants in the same area of the park, the other one being Dell restaurant. 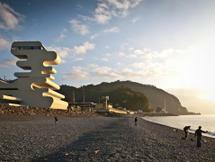 It consisted of concrete terraces which..